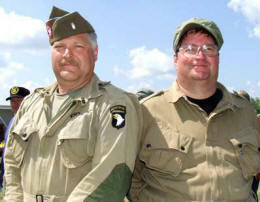 CAMP PERRY, OHIO – Junior air gun shooters comprised three of the five and five of the top nine finishers in the 2010 AiR-15 Challenge event held at the CMP Competition Center on Saturday, 7 August including a second place finish by Daniel Hall, 14, of Green Bay, Wisconsin. SSG Tyrel Cooper, USA, and former California Grizzlie junior shooter, placed first in the Top 20 Shoot-off with a score of 196-5. Hall was a point behind at 195-4 and 17-year-old Steven Hahn of Middle Grove, New York, placed third with a score of 194-6 in a center shot tiebreaker over his father, Edward, 45, who shot a 194-5. The CMP Games events have become a staple at the conclusion of the National Trophy Rifle Matches. The Games are a unique opportunity for competitors, collectors and history enthusiasts to showcase rifles that played pivotal roles in American history. At the CMP Games Matches, it is not glory that people are seeking on the range, but rather a chance to shoot the same rifle that their father, or grandfather carried in WWII, the Korean War and other conflicts. Of course medals are awarded and winners recognized, but the ultimate goal of the CMP Games is fun and friendly competition. 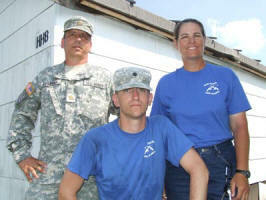 CAMP PERRY, OHIO – The California Grizzlies junior rifle teams put on an impressive display of marksmanship, winning the National Trophy Junior Team Match (NTJT), the Minuteman Trophy and the Junior Infantry Team Trophy at the 2010 Civilian Marksmanship Program’s National Trophy Rifle Matches. 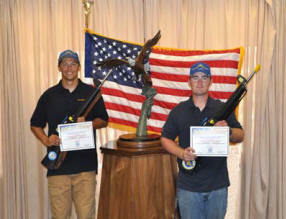 The two-person California Grizzlies Berger team of Chad Kurgan, 19, of Twain Harte, and Anthony Henderson, 20, of Sonora fired a team score of 967-26X to win the NTJT and set a new National Record. Kurgan fired an aggregate score of 492-19X and Henderson followed with a 475-7X. 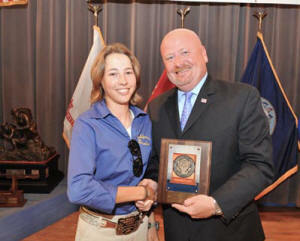 CAMP PERRY, OHIO – A pair of 16-year-olds, Sagen Maddalena, of Groveland, California, and Tyler Rico of Tucson, Arizona, led a talented class of junior shooters at the 2010 CMP National Trophy Rifle Matches. Maddalena was the high junior shooter in the President’s Rifle Match, finishing 36th overall with an aggregate score of 291-8X, just four points below the cut-off score for the Top 20 shoot-off. Rico, at 39th, tied her in raw score but trailed by two center-shot Xs. 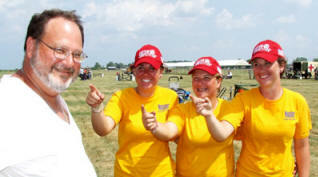 CAMP PERRY, OHIO – Curt Horomanski, 52, of Monroeville, Pennsylvania, says he’s happy to provide shooters for the Steel Eagles junior rifle team. His oldest daughter Chessa, 22, recently graduated from the junior ranks but he still has three daughters shooting with the Steel Eagles and members of the Pennsylvania Rifle and Pistol Association. Elyse, 19, Jenna, 16, and Marie, 14 – all point their fingers at dad when asked who’s the driving force behind their participation in service rifle competition. 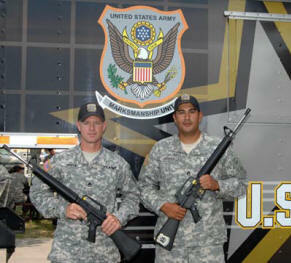 CAMP PERRY, OHIO – The Bearkat Battalion Army ROTC rifle team from Sam Houston State University (SHSU) rolled into the 2010 National Trophy Rifle Matches as the only collegiate entry and came away with valuable experience and high expectations for their growing highpower program. 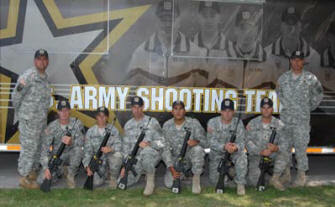 The Army Marksmanship Unit (AMU) has rolled through the 2010 National Trophy Rifle Matches with almost complete dominance. Shooters from the AMU finished first in the National Trophy Individual Match (NTI), the Hearst Doubles and for the fourth year in a row, the National Trophy Team Match (NTT). The team also reclaimed the top spot in the National Trophy Infantry Team Match (NTIT or “rattle battle”) after a shocking fourth place finish last year behind three civilian teams, including the historic win by the California Grizzlies O’Connell Juniors. 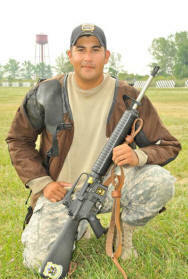 The 2010 National Trophy Matches have been pretty good for SGT Tyrel Cooper of the Army Marksmanship Unit (AMU), he won his first National Trophy Individual (NTI) title on 3 August and doubled his trophy count the next day when paired with SSG Brandon Green for the Hearst Doubles Match. Both have won the NTI, SSG Green in 2006, but neither has been on the winning team for the Hearst Doubles. They have both come close to adding their names to the William Randolph Hearst Trophy, finishing as high as second when paired with different AMU teammates. Last year SGT Tyrel Cooper of the Army Marksmanship Unit (AMU) had a strong finish in the National Trophy Individual Match, but still fell just short of the overall title. He finished second by two-points to MSG Jack Pardy, USAR, with a 493-18 to Pardy’s 495-18. This year the match was determined by a much smaller margin, but after the last scorecard was entered, SGT Cooper found himself at the top of the leader board. It took x-counts to win the match, as SGT Cooper finished the day with a 595-23, edging out his AMU teammate, SFC Lance Dement, who shot a 495-20 to claim second.